The city is witnessing a multi-cultural zing at its peak this week. Hyderabad is ‘God’s Own City’ as we have the prestigious TirumalaA�Vaibhavotsavam on one hand and we are gearing up for Valentine’s Day on the other. Red rosesA�and gifts galore in some parts;A�saffron and white flowers in other areas.A�Added to this, my co-host from radio told me it was Chocolate Day this week. The more, the merrier to celebrate. I sang at the TTD festival this week. It was all glamour and glitter in the most divine ambience! 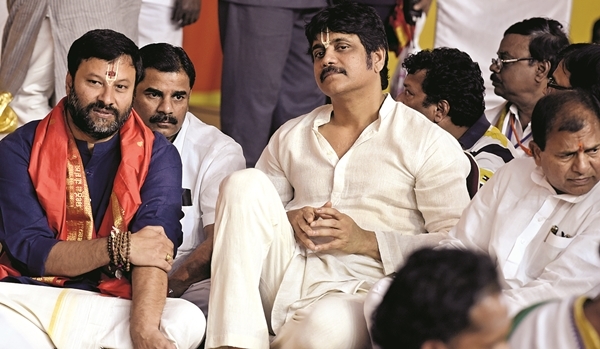 Floral decorations, well-dressed devotees, many stars like actor Nagarjuna and page 3 celebrities visited the premises that was almost a second Tirumala. One would also have thought that people would not drive on a weekday from work for a few hours for an event like this. But wait. Thousands thronged the area fromA�5.30 pmA�onwards on a MondayA�evening. Politicos Chintala Ramachandra Reddy, Dr Laxman and a few others came with their families. Actors Allari Naresh and his wife were engrossed in the mood of the evening. Film director K Raghavendra Rao was there to oversee a few things too. Now what more can people ask for? This was a perfect alignment of everything under one pandal. Everyone who attended had their dress code perfect, silk clothes andA�the traditional long red line on their foreheads. We are talking of young college students too. Undeniably, there was some kindA�of a surreal power in the area! a�?It is indeed a blessing to be here in the presence of Lord in our very own city,a�? said Naresh. I wondered at the sheer faith-driven energy that builds up the vibrations in a place. Just a few weeks ago, this place hosted a book fair and now has turned into a temple town. I really commend our ability to make things and happenings larger than life. We go to Numaish, the city exhibition. The very next week, we switch over to the devotional mood and attend a religious do. Before someone can brand us religious, we go out and support charity causes. Amidst all this, we shop, party and still have time to work. Amazing we are, arena��t we.